Does crafting for profit sound good to you? Turn your hobby into cash? Do what you love and make money at it? Maybe enough to quit your day job? If you are good at crafts, this is 100% possible! There are plenty of crafting for profit opportunities, perfect for a part-time business, a stay-at-home mom, or anyone that wants to be in business for themselves. Below I discuss a few of the different ways to get you started. Maybe just one will be right for you, or maybe all of them. You can combine any of the options below for even more money making opportunities. Crafting for profit can be possible by selling your crafts at local craft fairs and bazaars. Just check out your local newspaper to find some in the area. Craft bazaars usually take place over a weekend, and the sellers usually pay a fee for the table or rental space to display their items. Craft fairs are very popular in the Spring for the Easter holiday, in the Fall, and at Christmastime. Many people work all year on Christmas items, and sell all their work at the end of the year. If you have never sold at a bazaar before, start by going to some of the local craft fairs and look around. Find the ones that have a good turn out and good traffic. Ask the sellers about their day, how busy they have been, etc. Most craft fairs repeat every year so you will have an idea of which ones you like and which to participate in for the next year. Also take a look at how the sellers are pricing their work, the types of items they are selling, and how they have set up their booth. These are all things you will need to think about if you participate! 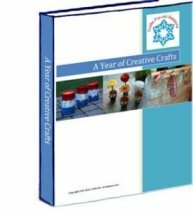 How much money can you get for your crafts? The typical rule of thumb is to double the amount that the materials cost. However, if you are very talented (for instance, you do very intricate painting), or have a very unique item, you can ask more. People pay big bucks for unique handmade items, especially things that can be given away as gifts. Etsy is a crafters marketplace for artists selling their homemade goods. It has become really popular and many sellers have been very successful with their stores. There is no fee to set up an account or your store front. In fact, you can have as many stores as you like. They charge $0.20 for each item you list, but it gets to stay up in your store for four months or until it sells. Once sold, Etsy collects a small commission. It is fun to browse at Etsy. If you are thinking of giving it a try, first read explore successful stores on Etsy to see how they set them up. Read the success tips and advice for successful selling that Etsy provides. The two main advantages are taking great photos with the same background, and keeping your store cohesive. That means if you sell beaded serving spoons, keep it to beaded serving spoons and other beaded crafts. Don't try to sell knitted items in the same store. However, since it is free to set up many stores it is not difficult to keep your stores categorized correctly. Give it a try! At 20 cents an item it is worth a go!m below. Another online crafters marketplace, much like Etsy, is Artfire. Artfire works slightly different because you pay a monthly fee (currently $12.95) for your storefront, with no limits or fees for the amount of items you list or sell. They work with the major search engines to promote your crafts to the world. They also have perks like coupon codes, ways to promote sales, and vacation mode, where you can send out a message when you'll return. Can't beat that! Some people don't like sitting at a table for an entire weekend at a craft bazaar. They may want to reach out to a larger audience. And you know what? That's very smart. With Ebay, your crafts can literally be seen around the world. Ebay has made crafting for profit easier. Ebay has a category for “handcrafted items” under their larger category “Crafts”. Ebay makes their money by charging you a small fee to list an item for auction, and it also takes a percentage of your final auction ending price. What you get in exchange is exposure to millions of people at the same time. If you continue to sell items on Ebay, people who like your work even get to know you and remember you as a seller. Your fans may do Ebay searches to find your items, or sign up to get emailed every time you add a new listing. Many people I know have bought things on Ebay but have never sold anything. They say “I don't know how.” It is not hard! Please do not be intimidated. You will never learn how to do it unless you sit down and teach yourself. Begin on Ebay and hit the tab at the top of the page that says “SELL”. Ebay has an excellent tutorial that walks you through all the steps. Take your time, and your listing will be up soon. Once you know how to do it, you can list other items very quickly because Ebay remembers all your information. Sign up for PayPal too, (there's a link for it on Ebay) because most people are using this service now. It is a wonderful service because it handles all the transactions and you know the money will be in your checking account immediately before you send out your item. I have found Ebay to be very fun, and addicting, as a seller. It is very fun to check often while your auction is going on to see how high the price has gotten! In addition to selling on Ebay, another way to begin crafting for profit is to start your own website. Once you start getting traffic and sales, you can quit selling on Ebay and keep the entire profit for yourself. All you need to get started on a home business is a computer and the Internet. If you think this is way beyond you, you are wrong. Even if you know nothing about building a website there are many ways you can learn. I use the service SBI and love everything they have to offer. They make it easy to build a complete website, and build a business.